The department for Science and Research is in the ground floor of Faculty of Mechanical Engineering in Dejvice, Technická street 4, Prague 6. 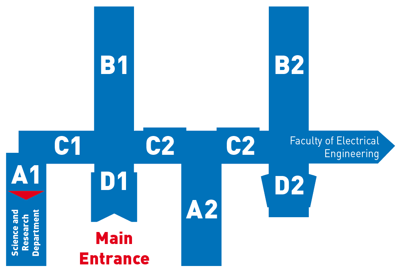 As you go enter the main entrance, go through the hall, turn left, go through the silver door and turn left at the end of the corridor into a corridor A1, The first door on your right will be number 15 and there you find the officer for doctoral studies. The doctoral studies at the Czech Technical University in Prague are regulated by Act No. 111/1998 Coll., in accordance with the Rules of Doctoral Study and the Study and Examination Code for Doctoral Studies at the Czech Technical University in Prague and the directives of individual faculties and institutes. To be admitted to doctoral study, applicants must hold a master (not a bachelor) degree of the same or related branch of study. The Dean of the relevant faculty or the director of the institute decide on the admission based on the results of the admission procedure. The candidates are not required to have a previous experience in the field, nor are there any age restrictions. Students in their final year may also apply for doctoral studies. Their admission is conditional upon successful completion of their studies. The doctoral programmes are available for citizens of the Czech Republic, foreigners and stateless persons, legally residing in the country. A post-graduate student of the CTU is the person who has been admitted to the doctoral study. The aim of the doctoral study is to prepare graduates for scientific or artistic creative work. The obtained higher qualification, including language skills, greatly enhances opportunities of the graduates. The doctoral programme is carried out through full-time and combined forms of study. The full-time study usually takes 4 years (standard length), the combined form of study usually 5 years and can be interrupted. The combined form of study is not carried out yet. The transition from one form of study to another is possible based on a recommendation from the supervisor and a written request from the post-graduate student to the dean of the relevant faculty or the director of the institute. The studies can also be completed in a shorter time upon an approval of the supervisor and the relevant Branch Board. A full-time post-graduate student is a regular university student with all rights and responsibilities during the time of his/her studies. In both forms of studies, the post-graduate student is required to deliver a dissertation within 7 years since the beginning of the studies. The studies are organized according to an individual study plan which determines the time distribution of studies, specialized and scientific activities aimed at developing the dissertation, educational exchanges with other institutions including those abroad, certain minimum of pedagogical activities, dates of subject examinations and other obligations. The individual study plan is designed upon an agreement between the post-graduate student and the supervisor who is appointed by the dean of the faculty or the head of department. The supervisors are professors, associate professors or prominent experts. The study part of the individual plan is completed by passing the required subject examinations and a specialized study. Afterwards, it is possible to take the State Doctoral Examination where it is necessary to prove one's orientation in specialized theoretical knowledge, methods of scientific work, ability to adopt new scientific knowledge and its creative application. The State Doctoral Examination is performed in front of a Board of Examiners for State Doctoral Examination. Its successful completion is a pre-requisite for the Defence of the Doctoral Thesis. The thesis is a result of solving a specific scientific task and may be submitted in the form of a published work or one which is prepared for publishing as well as a set of publications. The dissertation must contain original and new findings. The Defence takes place in front of a Board for the Defence of the Doctoral Thesis and is open to the public. In case the State Doctoral Examination or the Defence of the Dissertation is not successful, there is one possible repetition. The doctoral studies can be terminated earlier upon a written request from the student. In case of long-term neglect of responsibilities, the dean or the department head can decide to terminate the study. non-mandatory, which can be granted for outstanding academic achievement and for participation in research and pedagogical activities of the training centre. It is also possible to obtain a so-called special-purpose scholarship for participation in research or grant project. Accommodation for post-graduate students living out of Prague is available in the university dormitories and meals are offered in university canteens. There are 6 weeks of holidays in the academic year.